Margaret Meserve, Carl E. Koch Assistant Professor of History at the University of Notre Dame, has won the American Historical Association’s Helen&Howard R. Marraro Prize, which recognizes the best book or article on Italy, for"Empires of Islam in Renaissance Historical Thought." The book, recently released by Harvard University Press, surveys how 15th-century historians and political commentators tried to explain the rise and fall of Islamic empires. 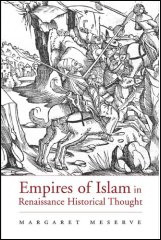 Drawing on political oratory, diplomatic correspondence, crusade propaganda, and historical treatises, Meserve demonstrates how research into the origins of Islamic empires arose from and contributed to debates over the threat of Islamic expansion in the Mediterranean. Her book offers insights into Renaissance humanist scholarship and the long-standing European debates about the relationship between Islam and Christianity. Meserve, a member of the Notre Dame faculty since 2003, specializes in the intellectual and cultural history of the Italian Renaissance. She earned her bachelor’s degree in classics from Harvard and both her master’s and doctoral degrees from the Warburg Institute of the University of London. She has published articles on anti-Turkish polemics in the Renaissance, European knowledge of Asia in the centuries after Marco Polo, and the printing of crusade propaganda and news reports from the Orient. Two volumes of her translation of the crusading Pope Pius II’s autobiographical commentaries have been published by Harvard University Press. Originally published by Kathleen McDonnell at newsinfo.nd.edu on December 02, 2008.